Why is love so closely related to war? “All is fair in love and war.” This idiom is centuries old, and we have seen it in many literary works. 1604 Don Quixote when he wrote, “Love and war are all one . . . It is lawful to use sleights and stratagems to . . . attain the wished end.” Afterwards, Frank Fairleigh wrote, in one of his novels : “You opened the letter!” exclaimed I. So, in love and war, you can use any tools. You can use any weapons, to attain the object of desire, or the goal. But this also means that there is no logic, no reason, and perhaps barely any empathy. We kill both in love and in war. We murder. We walk away. We walk on, and the dead become the dead. There is a song titled “Draw Your Swords” that I think captures this image. These are the lyrics, followed by the link to the song. Crowds of people swarming in front of me. They all went to pray. I found my way to you, with my blurry vision, with shaking hands, I drove to you. It felt like driving all night long. Time with you is different altogether. I can’t tell my days anymore. I don’t understand how the clock works. I have lost basic skills. But once I arrived, the ritual started. It was a different prayer. There was soul, there was heat, there was meaning in the way there was a world within you. I bowed my head, silently. I had to take a moment. To take you in. That moment wouldn’t change. It seemed time had stopped, I bowed my head and never got back up. There was a mark on me. I found it the next morning. The taste of love is bloody and bitter. There is a heaviness in my chest that won’t leave me alone. I should have asked you to stay, but I was afraid of the answer. I walked out. I don’t know if I will find my way back home. Something they don’t teach you in your temple. They envy us because we’re mortal, because any moment might be our last. Everything is more beautiful because we’re doomed. Homer is absolutely correct. Immortality might take away from the beauty of life. Having it all? Not only is it unrealistic but it limits the experience of life in its grotesqueness, ugliness, and suffering. It gives you one perspective. And any singular perspective is limited and limiting. For individuals with disabilities/chronic illnesses, I would say that the time factor presents itself in everyday life, in matters of the heart, in career decisions, choices, and in this concept of “life” and what it means to live. Because the clock ticks, there is a shadow of an ending, of inevitable loss. The loss is one’s self. The death is metaphorical, it is not life that ends, but instead, a part of you that withers away, leaves you standing in front of the mirror looking for you. You can’t explain it to others because their first reaction is “you’re a pessimist” or “be positive.” There are people who will say you are too afraid of life. I know MS is a part of my life I must make amends with, accept it, but it does not mean I should be celebrating it. There is nothing to celebrate. Perhaps we always think in terms of black and white, right or wrong, normal and abnormal, celebrating and grieving, gaining and losing. There is always a gray area. A different way of bridging the gaps. There is sadness and a distinct hope at the same time, a contradiction that is very real. When you are aware of the clock, you cannot help but embrace the moment. You want to dig your nails into the body of the beloved, you want to eat that piece of chocolate, and you want to travel today, not tomorrow. This concept of tomorrow seems too vague, too unsafe. My relationship to time is different. I think about time and space in a very concrete manner. I don’t leave it all up to “InshAllah” or “if God wills, tomorrow.” Being passive bothers me. When you feel the world around you is making decisions for you, you feel the need to start the car’s engine and drive at full-speed. Not in a reckless manner, not in a crazy manner. But just enough. Just enough for the thrill. To taste the moment. To make you feel that you have not missed out. Who wants to miss out on any bit of this journey? We’re all passengers, yes, as cliche as that sounds. I don’t want to sit in the backseat. It has to count more than that. I am so silent. It is so quiet in my head. The world around me goes on. People speak. There must be something inherently wrong with the universe. When soulmates separate, why is it that the world goes on? I don’t see anyone mourning the loss. They say it lasts 40 days. But I was never one who believed in time. Observation: Time takes time. But your smile is eternal. Forever feels strange. There’s always this illusion of forever, of everything being timeless, having no expiry date. But there can’t be a forever. Immortal love? Hmm. As we grow older, it seems this concept of forever changes. You realize time is more vague. People promise “forever” when they’re young. And then there is a forever that we re-defined. You and I, we always re-label and re-write. Admitted that there is no forever. Admitted that everything slowly changes and withers away. But we were left with multiple forevers. There’s a momentary forever. What stays is bigger. And perhaps the world is not ready for our definition. 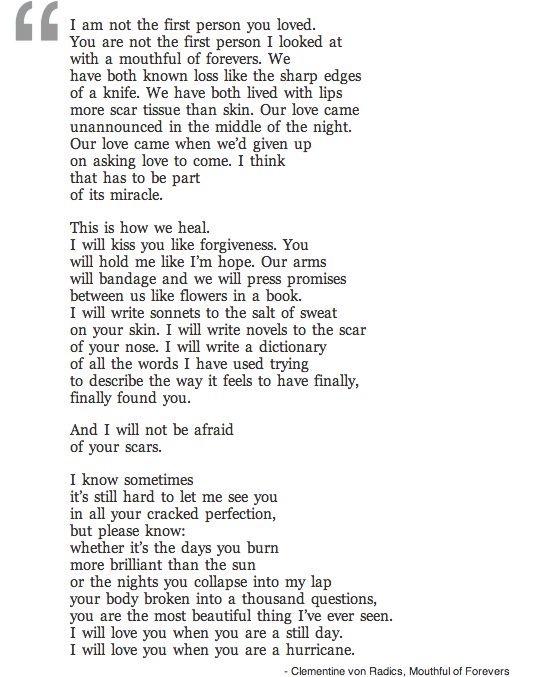 This is Clementine’s poem, ‘Mouthful of Forevers.’ I am reposting it here. A step. Two. Here it goes. It looks easy, doesn’t it? You’d think so. But here it is, this heaviness that drags. This struggle of walking. It feels like walking through mud. Except you’re wearing heavy boots, and you can’t seem to carry yourself. The burden of you. This strange connection between the brain and the body. It is a strange state of being. Being a slave to this body. Who is in charge? They say the mind is superior to the body. We grow up conditioned to believe that your brain is sharp, that your body is just the follower, that you need to work on strengthening your mental skills, that the body is just a vessel. So how is it that the body is in control? It cannot be just a vessel. The body is what you see. Nobody sees your inner core, your self. What you see is what you get. The body is your Passport in life. When you are exiled from your body, do you get to go anywhere else? And these are, as always, the random ramblings of a confused mind. So here’s to you and me. And this explosion of everything.